multiple of 8 again .. it ends at 24...to get to 26 we need to have two bits .. so tick two bits vertically and horizontally in the table two ..
our ip falls here ..
seeing the table under subnets it stops at 240..so remember we have only one multiple of 8 .. so only one 255 in subnet mask..
so 8 + 8 + 8 + (1) --------- left ..
see the table two and come back you will find number 128 under subnets and 128 under bits ..
i took darby weavers advice and went after train.signal and man he has details ... first few times i felt bored and closed the window ... but after the third i began to see his notes and points both becoming valuble ... now no longer iam considering to go after cisco press as i will take the book exam certification guide rather than student guide ... the download of ccnp.video mentor is on progress and i after that i will even see that .. and then go on for ccie training videos on ospf ... i thought of checking my lab practices and level on ccnp ..and they are just improving .. i have began labbing from cisco lab guide for ccnp and this is the first of the 5 topologies . here is the topo and router show runs ..... after iam done with labs i would post the important points as what i found in both cb.t and train.signal , video.mentor..
save your configuration for use in the next lab exercise. 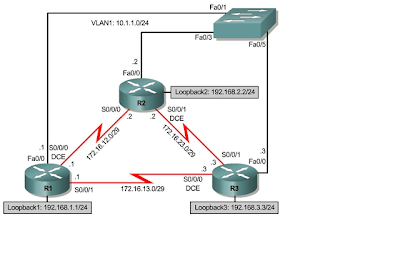 for the last week or so there were no updates on study materials and techs because of two reasons ..
seeing all the videos one thing i could see my self is ospf is really big and vast .. and a real busy routing protocol ..
8.a sample of redistribution and auto adjusting cost with no pain at all . rather than presenting with running configs it will be better off to mention the commands i used in this ... because i too never understood what those frame-relay commands were meant for .. so i wont post any of the configs till my understanding ... here are the commands i learnt in this ..
by far most important point is to avoid split horizon rule in frame-relay other wise router will stop sending updates to other .. The worst of lab experience is for these two labs lol... yes making a router as a frame-relay switch..nothing went on well for me .. the topology tables were not updated and i had to do this lab for thrice with no success lol .... i will try it again on original routers in the evening and wil let you know what exactly are the points .